Queensland’s former Premier Campbell Newman is chairman of a company Swarm Farm that is developing robots for on-farm use, in tasks such as weeding (as reported in the Brisbane Times). This is fantastic technology and will be good for agricultural production and productivity. It is another application of technological improvements that boost on-farm productivity, with other recent applications including the remote operation of irrigation equipment by laptops (see this IT World story). Of course, this productivity growth will be associated with labour savings, and I was reminded by the Swarm Farm story that productivity improvements in agriculture over the last few decades have been associated with a decline in the number of jobs in agriculture (see chart above). 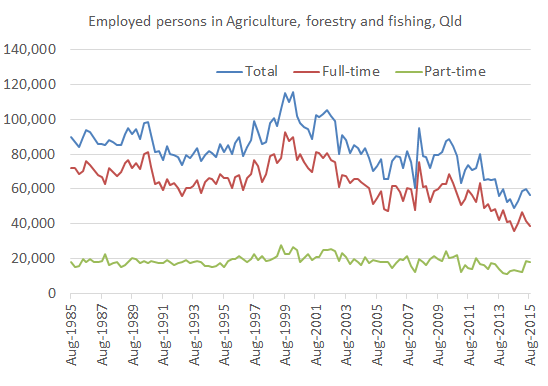 While the value of industry gross value added in agriculture, forestry and fishing has doubled since 1990, employment in the sector has fallen by around 40 per cent. This productivity growth in agriculture is good for the economy because it frees up labour for more productive tasks, although possibly not for jobs in regional areas. The movement of people from less productive tasks on the land to more productive tasks in cities has long been associated with economic development. It explains in large part the strong economic growth China has experienced in recent decades, and it explains why the British Agricultural (or Agrarian) Revolution was a precursor to the Industrial Revolution. That said, the productivity growth we are seeing on-farm should warn us not to expect an on-farm jobs bonanza from the agricultural export boom that is being forecast due to growing food demand from Asia. This book should be a good read. Earlier this year, I was interviewed by the author regarding what recent Queensland political history means for the prospects for economic reform in Australia. I will certainly post a review of the book when it is released. This entry was posted in Agriculture and tagged agriculture, cando, productivity, qld, queensland, robots. Bookmark the permalink. 1. One of the big drivers of the switch to new technologies and reduced employment in agriculture was the fact that operators of heavy machinery (harvesters, trucks etc) were all moving to the mining sector where wages were much higher. This trend is now reversing, farmers can compete for labour again, and farmers’ commercial returns from technology investments are actually declining. 2. The technology is imported, and the price would have just increased by about a quarter in the past 3 months. Most farmers in Queensland are actually pretty slow to adopt new techniques and technologies, and I don’t think the current economic climate is conducive to any rapid investment in new technologies in the short-term. Thanks Jim, good points, particularly about the slowness to adopt new technologies. The full fruits of the technological switch will happen over decades rather than anytime soon (we won’t be seeing the Terminator walking down Main Street Ballina after a day on the macadamia or strawberry farm). Farmers around the world are typically slow atodopters of technology and other methods to enhance multi factor productivity. The agrarian “revolution” in the UK was slow by modern standards. For various reasons labour has often been hard to get for agriculture. It simply can’t compete with the wages of urban based firms and remain profitable. Also I’m sure most of us are aware of the armies of Mexcan’s working the agricultural fields in the USA. These problems are not a Queensland phenomenon. Once the supply of those armies of Mexicans in the USA dries up and the supply of labour in China dries up then the powerhouses of technological innovation and invention will step up a notch. Then, Gene, you may get your Terminator! Haha, that would be interesting! Thanks for the comment, Alistair.